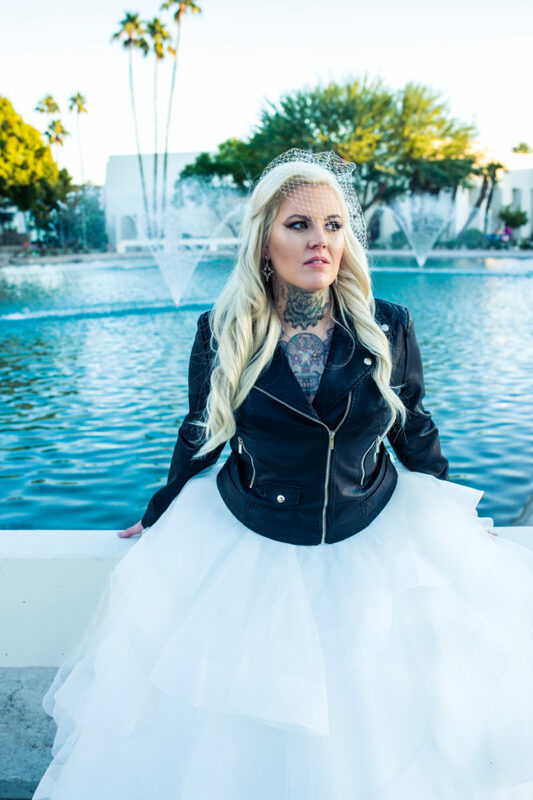 We’re super excited to feature our Strut Bride, Nicole! 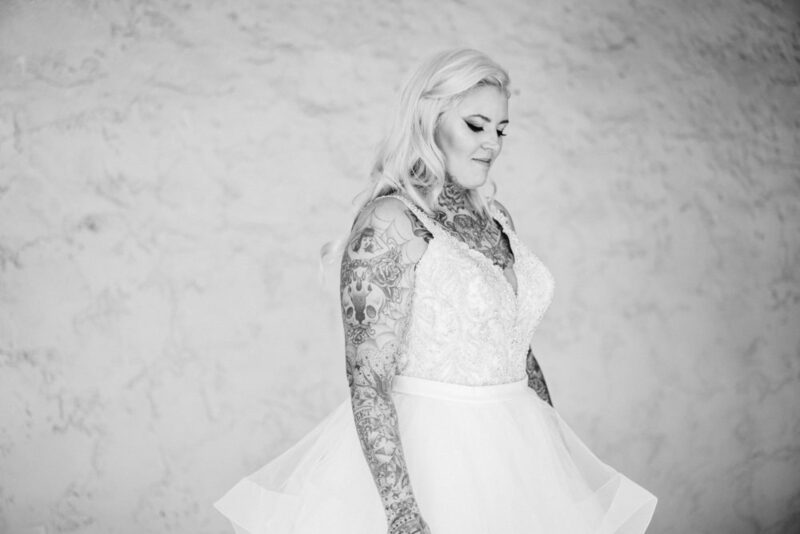 Nicole came to us in June of 2018 looking for the perfect horsehair trimmed dress to rock on her wedding day. She brought the most important people with her to help determine if the right dress was waiting for her in our Tempe, AZ bridal boutique. Nicole let us know that she had been shopping at 3 different stores before she came to see us. Our expert stylists were ready to make Strut Bridal Salon her very last stop. 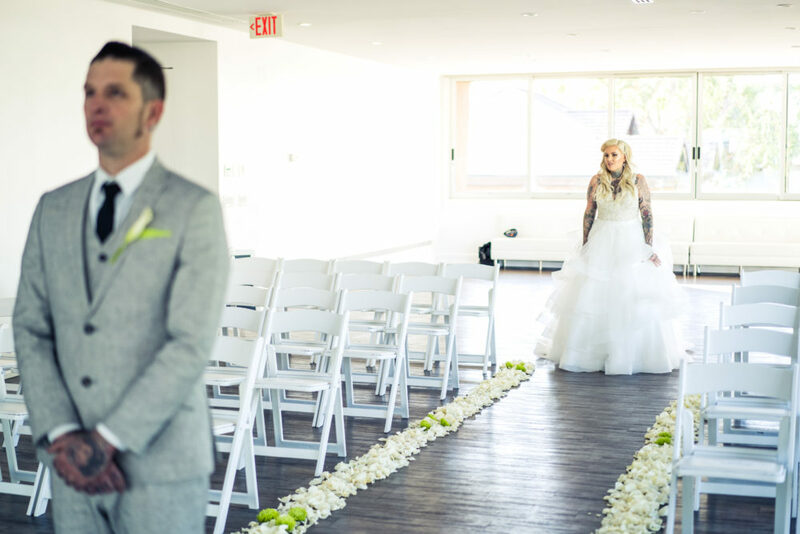 Check out Nicole’s ruffled ballgown wedding dress! 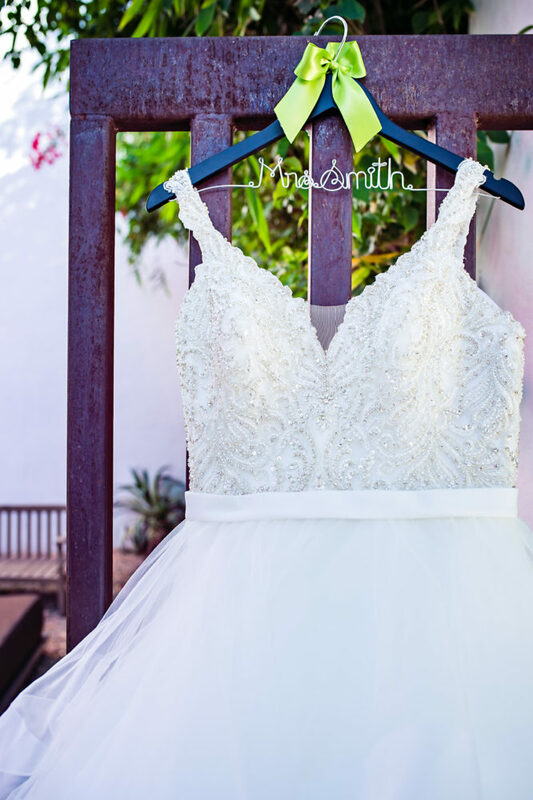 Ruffled ballgown wedding dress from our Arizona bridal boutique. 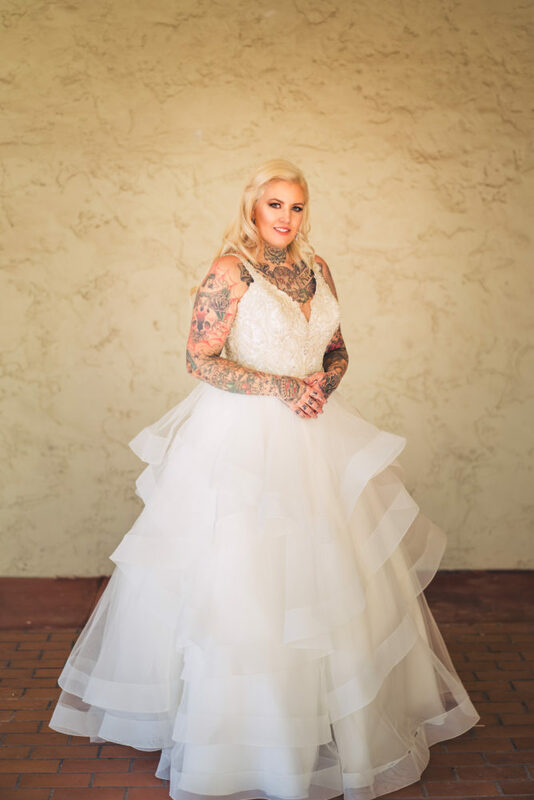 Nicole’s ruffled ballgown wedding dress features tons of texture, like dreamy organza and tulle with a fitted bodice swathed in hand beaded embroidery for tons of sparkle. 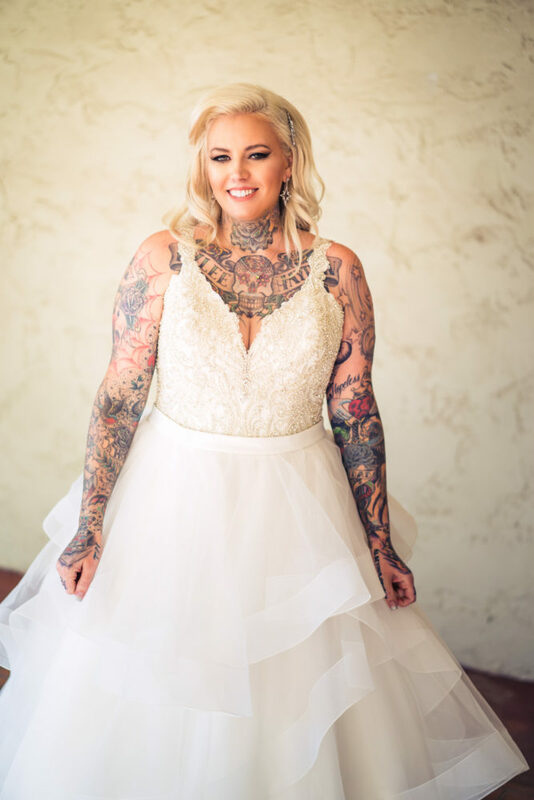 Her dazzling ruffled wedding gown also features a deep V-neckline accentuating her bust line and gorgeous tattoos alike. The sparkling embroidery covers the bodice and tank straps, which offer ample support for our bustier girls. Nicole wore her wedding dress in ivory, but it is also available in white. We can’t get over how fabulous this dress is and that hanger is too cute! Thanks to Becca Gutierrez of Rusty Metals Photography for the awesome pictures! 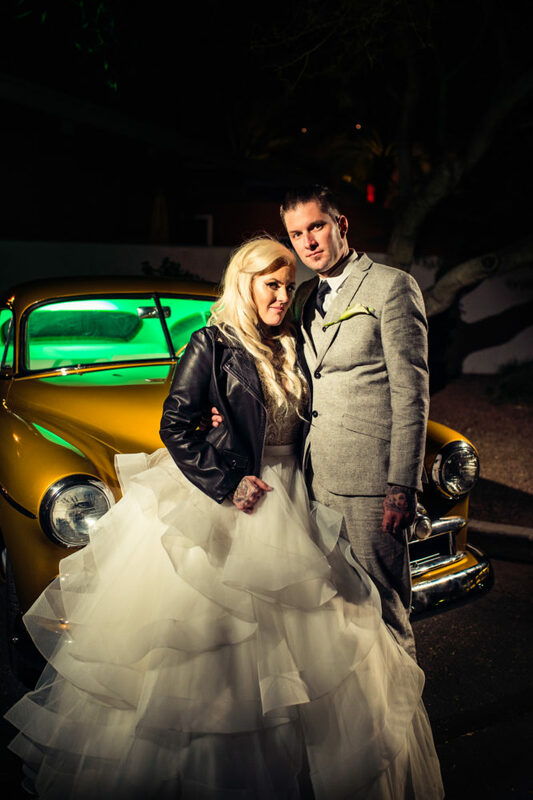 Nicole and Adam tied the knot in December of 2018 at The Clayton on the Park in Scottsdale, AZ. We’d like to congratulate the newlyweds and wish them all the happiness in the world. We’d also like to thank Nicole for letting us be such a special part of her big day. If you’re in love with Nicole’s dress as much as we are, its still available to try on at both our Tempe and Long Beach bridal stores. Head over to our appointments page to book your visit today. We have free bridal appointments and special champagne bridal appointments, too.